For generations Nachshon’s family has been enslaved by the Egyptian Pharaoh. Nachshon is afraid it will be his destiny too. Then Moses confronts the fearsome Pharaoh, and Nachshon’s dream of freedom begins to come true. But soon he has to overcome his own special fear. The story of the brave boy who was the first to jump into the sea will inspire young and old alike. Kar-Ben also has an eBookstore! 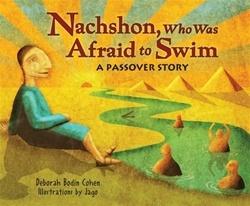 Buy the Nachshon, Who Was Afraid to Swim eBook!